Late this spring Shout! Factory ended a long wait for fans of CBS’ modern classic sitcom The Nanny when it released the series in its entirety in the form of The Nanny: The Complete Series. For fans that might not have been lucky enough to get their hands on that set, Shout! Factory has announced that it will begin releasing the series’ standalone season sets next month beginning with the series’ fourth season. Shout! 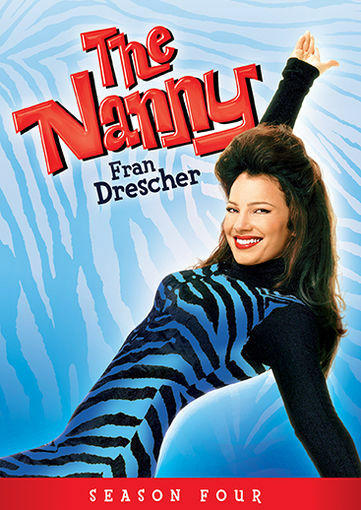 Factory will release The Nanny: Season Four on Tuesday, September 22nd. The twenty-six-episode run includes plenty of laughs and just as many big-name guest stars including: Bette Midler, Donald Trump, Pamela Anderson, Celine Dion, Jon Stewart, Jason Alexander, and Joan Collins among many others. One of those guest stars–Jason Alexander (Seinfeld)–appears in the season premiere “The Tart With A Heart.” Alexander plays a blind man named Jack in this episode. Fran picks up Jack at a singles bar after tensions rise between herself, Mawell, and C.C. The tensions in question rise from the revelation that Maxwell in fact hired Fran only for her looks. Of course things don’t go quite as Fran planned with Jack in the long run leading to an interesting outcome between Fran and Maxwell. There’s an equally classic story line later in the season in “Kissing Cousins” in which guest star Jon Stewart (The Daily Show) plays Frans cousin. The catch is that Fran doesn’t realize that Stewart’s character is in fact her cousin. This leads to plenty of laughs thanks to a battle of the sexes of sorts between Fran and Maxwell. In “You Bette Your Life” famed singer/actress Bette Midler appears as herself when Maxwell decides to assemble a charity auction. The auction leads to Fran becoming the babysitter for a talented young 10-year old piano player. Things don’t exactly go as planned for Fran and Maxwell in this episode as the sight of an elderly person dying while he performed at a nursing home puts a multi-million dollar deal from the boy’s father in jeopardy. There are plenty more laughs for fans throughout the season’s twenty-six total episodes. And audiences will get to enjoy them for themselves when The Nanny: Season Four is released next month. Season Four’s complete episode listing is noted below. 12 The Nanny: Danny’s Dead And Who’s Got The Will? Next Tuesday, October 14th, Shout! Factory will release its latest complete Nicktoons box set thanks to its partnership with Nickelodeon and Viacom. CatDog: The Complete Series follows Shout! Factory’s most recent complete Nicktoons box set Hey Arnold! : The Complete Series. That box set was released August 19th. And as with that series, CatDog: The Complete Series will be available exclusively via Wal-Mart stores nationwide. This latest box set is another wonderful addition to the home library of Nicktoons Nostalgic that grew up in Nickeldeon’s golden era. The most obvious reason that any grown up fan of this series will appreciate this new complete series set is the same as Shout! Factory’s previous full series Nicktoon sets. It contains every episode from the series’ original run on Nickelodeon. 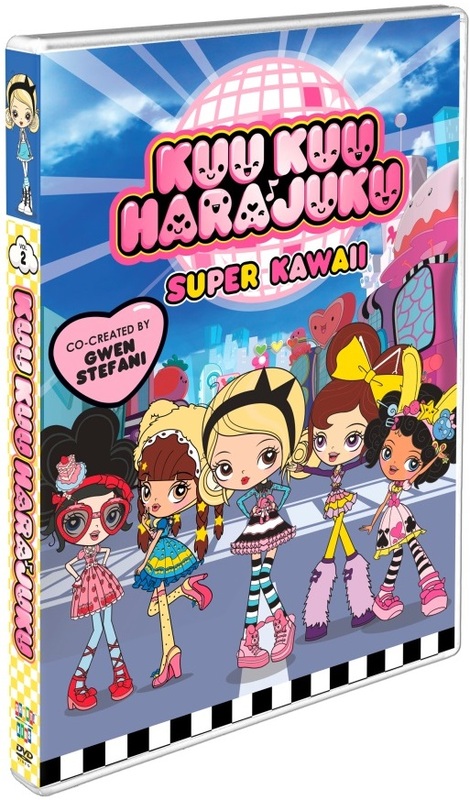 In connection to the episodes, they are contained on the same total number of discs from the previously released stand-alone sets. The difference is that the twelve discs that make up the series are contained within only two boxes. This saves space on any DVD rack. It’s one more reason that audiences will appreciate this set regardless of whether they have already purchased any of said the said stand-alone boxes. 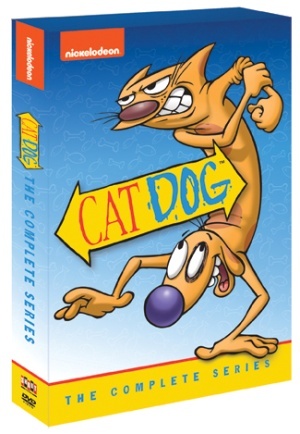 And last of note that makes CatDog: The Complete Series another welcome release from Shout! Factory and Nickelodeon is the writing that went into the episodes. Together with the set’s packaging and the inclusion of every one of the series’ episodes, it completes the box set and makes it all the more welcome an addition to the home collection of any Nicktoons Nostalgic. CatDog is one of the last of Nickelodeon’s great series that earned the title Nicktoon. Next to the likes of Hey Arnold!, Rugrats, and Doug, it was one of the last of a special breed of cartoons for kids. After it ended its initial run on Nickelodeon, it ran in re-runs for a while until the network’s heads decided to move the kid favorite series over to Nickelodeon’s digital “sister station” Nicktoons. Most cable and satellite carriers general keep Nicktoons on their upper digital tiers, thus making it a premium channel that costs extra for subscribers. Suddenlink made things even more difficult for audiences recently when its dispute with Viacom led the carrier to drop not just Nicktoons but all of the Viacom networks that it once carried for customers across the country. This means that for possibly thousands of audiences, there is now no way to see CatDog on television. This makes CatDog: The Complete Series even more of a positive for anyone that grew up with this series and other Nicktoons. So now regardless of whether or not audiences can get Nicktoons for one reason or another, Shout! Factory have made it possible for every Nicktoons Nostalgic to own one more piece of television greatness in its entirety. Things only get better from here, too. The set’s overall packaging should be taken into consideration, too in its overall success and enjoyment. The inclusion of CatDog’s complete series in Shout! Factory’s new full series set is something that most definitely should not be taken for granted. There are those that get Nickelodeon’s Nicktoons network and actually get to see this modern classic cartoon, given. But there are also those that don’t get the network for one reason or another. Whether it be because of the cost of subscribing to extra digital tiers on their carriers or their carrier not even carrying the network (as with Suddenlink’s dispute with Viacom), there are in fact those that don’t get to see these episodes. That makes the release of this set quite the welcome addition to those individuals’ home libraries. The set’s overall packaging makes it all the more welcome an addition to audiences regardless of whether or not they already own any of the series’ previously released stand-alone box sets. All sixty-eight episodes that made up the series are spread across twelve discs inside two boxes. Compared to those aforementioned stand-alone box sets, the packaging of the discs in this format takes up much less space on DVD racks than those sets by themselves. So not only do audiences get the complete series in this set, but they also get the complete series in yet another ergonomic package. Once again, the employees of Shout! Factory and Nickelodeon are deserving of their own share of applause for these efforts. It still is not the last of the factors worth noting that makes this latest full series set from Shout! Factory and Nickelodeon a win for fans. The final factor that makes this set a welcome addition to any classic Nicktoons fan’s home library is the series’ animation. It separates the series not only from other Nicktoons of its time but from every other children’s program on television today. The last piece of the puzzle that makes CatDog: The Complete Series such a welcome addition to the library of any classic Nicktoons fan is the series’ animation. There are still a few children’s shows out there today on cable the feature at least some amount of hand drawn animation. But by and large, most of today’s children’s programs are more based in computer generated “animation” than actual hand-drawn art. Unlike those shows CatDog was created largely by hand. If there was any computer usage in this series, it was minimal at best. Other than that, it gives the show its own identity much like its fellow Nicktoons and those series that came before it in the golden era of the “Big 4.” Taking this into account and the fact that true cartoons have officially gone by the wayside—weekday and weekend—such actual art work becomes increasingly valuable. It serves as one more example of what once made children’s programming so great and still could again one day given the opportunity. And together with both the overall packaging of this set and the inclusion of its full sixty-eight episode run, it makes this set a must have for any Nicktoons Nostalgic and for any fan of real cartoons. One part The Fast and the Furious, one part Need for Speed and one part Top Gun, the second installment of Anchor Bay Entertainment’s Born to Race franchise is a movie the surprisingly enough holds its own against its bigger-named counterparts. There’s no getting around the fact that the franchise, which started with Born to Race back in 2011, is not the first of its kind. Universal beat Anchor Bay to that punch with its massively popular Fast and Furious franchise. That aside, there is still plenty to enjoy in this latest installment in the Born to Race franchise. The central point of the movie’s success is its script (I.E. its writing). Unlike so many other movies backed by major studios out there, the script for this movie rips off neither its predecessor nor its bigger-named brethren. Another reason that this movie works as well as it does is its pacing. The movie moves fast. But it doesn’t move so fast as to leave viewers struggling to keep up with the story. And last but not least to consider is the movie’s casting. The movie’s heads wiped the slate clean with this movie, casting a while new list of actors to fill its lead roles. But those actors still get the job done well enough to keep the movie believable. 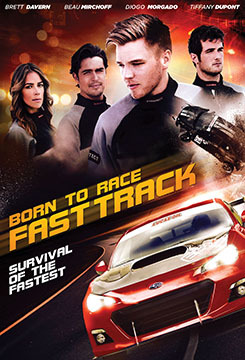 These three factors together make Born to Race: Fast Track a movie that despite being an independent release, is a movie that any fan of its genre should see at least once. The central point of success in Born to Race: Fast Track is its script (I.E. its writing). There’s no getting around the fact that it is not the first movie of its kind within the race-based action subgenre. That aside, it actually holds its own surprisingly well against Need for Speed and Universal Studios’ Fast & Furious franchise. Unlike so many bigger-named movies out there across the genres, Born to Race: Fast Track doesn’t attempt to rip itself off. Nor does it try to be just another of the aforementioned bigger-named movies in its genre. The only movie that one could even begin to say it does copy is Tom Cruise’s hit 1986 fighter jet flick Top Gun. It goes so far as to put lead actor Brett Davern in a pair of aviator sunglasses alongside co-star Beau Mirchoff late in the movie, in a scene that almost directly mirrors one well-known scene from Top Gun. Even with that blatant lifting, it doesn’t take away from the movie’s overall enjoyment. As a matter of fact, one could even go so far as to argue that paying such homage to such a classic film without any sense of hamming it up only gives this movie even more credibility. It would have been so easy for that moment to go overboard. But it didn’t. That combined with the fact that the movie’s writers opted to develop a story that didn’t blatantly rip off the Fast & Furious movies makes the movie’s script all the more enjoyable. The script behind Born to Race’s latest installment is the central point of the movie’s overall enjoyment. While it obviously does bear quite the semblance to Top Gun in terms of its plot, it doesn’t go so far as to try and be just another Fast & Furious or Need for Speed. It does at least try to be its own story to a point. Adding to the movie’s enjoyment is its pacing. The writing team behind the movie wastes no time setting up the movie’s plot. And once the plot is established, the writers keep the story moving. They do so without missing a beat, too. Most impressive of all is that as fast as the story progresses, it doesn’t move so fast as to leave viewers in its own proverbial dust (bad pun fully intended), wondering what they experienced by the end of the movie’s roughly ninety-minute run time. It switches gears at all of the right points and never finds itself idling, either. And yes, both of those bad puns were fully intended, too. The end result of that smart pacing is a story that movies fast, but not as fast as the cars that take center stage throughout the movie. Alongside the movie’s solid script, the pacing helps to make Born to Race: Fast Track that much more enjoyable for any fan of all of the racing movies out there. The pacing of Born to Race: Fast Track’s story and the story itself work together to make the movie one that fans of fast cars will enjoy even with just one watch. Both elements are important to the movie’s overall success and enjoyment. There is still one more factor to consider in the movie’s enjoyment. That factor is the movie’s casting. The production’s heads wiped the slate clean with this second installment of the franchise. None of the actors from the franchise’s first movie returned for this installment. The reason for this happening is anyone’s guess. It could have been the movie’s heads. It could have also been that the cast didn’t want to return for a second movie or simply couldn’t due to other commitments. Regardless, the cast tapped for this movie does its own part to make the movie work. The new cast members are all quite young. And most of the cast members are quite well-known in their own right, too. Lead actor Brett Davern is best known for his time on MTV’s hit series Awkward alongside co-star Beau Mirchoff. He also has dramatic experience, having acted in bit parts in CSI: Miami, In Plain Sight, and Cold Case. Mirchoff has also filled roles on CSI: Miami and CBS’ other hit crime drama CSI: Crime Scene Investigation. Younger viewers might also recognize him from his work on Disney’s Wizards of Waverly Place TV movie The Wizards Return: Alex vs. Alex. The movie’s other cast members have their own extensive resumes, too. That collective experience shows through quite well here. They are actually quite believable in their roles. That the cast would take its roles with such seriousness even on a flick from an indie studio shows a great deal of respect both for the studio and for audiences. It also makes suspension of disbelief that much easier for viewers. And in turn, it makes the movie even more worth at least one watch. Stories of WWII told from the American and British vantage points are quite plentiful in the world of television and movies. Stories from those in other Allied forces are far less. That is they are far less prominent in the United States. Now finally, another lesser told piece of WWII history has finally been added to the whole. 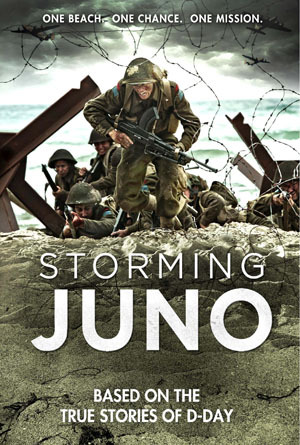 One part historical drama and one part documentary, Entertainment One’s brand new WWII story, Storming Juno is an impressive work. The hour and a half presentation tells the story of the events of June 6th, 1944 from the perspective not of the American or British forces, but from the Canadian military. It is centered on three young soldiers that were actually there on the day that marked the beginning of the end of the war in Europe. It is difficult to know where exactly to begin in the discussion of Storming Juno. It would be very easy to compare this movie to the likes of bigger blockbuster films such as Saving Private Ryan and Flags of our Fathers. By comparison, Storming Juno is just as good as those war epics if not better than them. That might be a bold statement to some. But it is a true statement. That’s not to say that the aforementioned films were bad. It just means that for an indie war film, Storming Juno definitely holds its own. And it does so quite well at that. So what enabled Storming Juno to hold its own so well against much bigger, more epic war movies? For starters, the movie itself runs just over an hour. The remaining half an hour of the entire feature’s ninety minute run time is taken by a documentary of sorts. Another factor in the success of this movie is tied directly to its run time. That factor is the story’s writing. Script writer Christopher Gagosz managed in his script, to balance the intertwining stories of the three men on which it focuses. Along with its balance, there are two more factors that make Storming Juno a success and a must see for any history buff and lover of war films. Those factors tie in to make this a complete story that any history buff and war movie fan will enjoy just as much as any war movie released by Hollywood’s major studios. The factors in question are the incorporation of actual footage taken on D-Day by Canadian forces and the general historical accuracies portrayed in the movie itself. These tie back into the writing and in turn the story length and overall enjoyment of the movie. It all works together to make Storming Juno not just an enjoyable war story, but also one of 2013’s best independent movies. Storming Juno holds its own against other bigger name war movies first and foremost because of its run time. Paramount’s Saving Private Ryan clocked in at a massive one hundred sixty-nine minutes long. That is roughly two hours and forty-nine minutes, or in simple terms, nearly three hours long. Paramount’s other major war epic, Flags of our Fathers, came in at roughly two hours and twelve minutes. Storming Juno on the other hand comes in at only ninety-minutes. The primary story itself (not counting the semi-documentary that follows the main story) comes in at just over sixty minutes. This puts the actual story at less than half the time of both previously mentioned movies. If one were to count the full ninety-minutes, then it would still be just over half the time of said movies. Thanks to the writing of Christopher Gagosz though, it doesn’t feel that ninety-minutes at all. It keeps viewers engaged through every action filled moment. Script writer Christopher Gagosz’s writing is largely to thanks for the movie’s ability to keep viewers engaged throughout its full ninety minutes. He does this because instead of focusing on melodrama, as Saving Private Ryan and Flags of our Fathers do, he instead balances the personal emotions of his subjects with the story’s action. While Juno Beach might not have been nearly as fraught with danger as Utah Beach, it was still dangerous. The body language of the soldiers as they waited to take the beach said so much without saying anything. It served to set the mood of tension, thus keeping viewers engaged. The action that ensued from the moment that the troop transports landed and the tanks were launched (and subsequently sunk) plays into that tension and does even more to keep viewers’ attention. Right to the battle’s final moments. As those final moments close, audiences are introduced to some of the men that were there at Juno Beach. Their interviews serve to cement the story presented and tie into the final factor of the movie’s success. That factor is its accuracy. Much of what is presented in Storming Juno was taken directly from both oral and written first-hand accounts of this battle. As noted in the bonus “Inside Storming Juno” feature, much work went into bringing the story to life and making it accurate. Even actual veterans from the battle were brought in to help set the scene, as was an individual with expert knowledge of the Royal Regina Rifles to make certain that the battle was portrayed as accurately as possible. It would seem that the only questionable aspect of accuracy is that of the planes used in telling the story of the paratrooper. They seemed to look like B-25s of some sort. Other than that one slight inaccuracy, so much else was done right with this movie. It ties right back in to the writing. And along with the writing and run time, it makes Storming Juno a movie that any history buff and war movie fan will appreciate regardless if another movie based on non-American or British Allied forces is ever made. It is available now in stores and online. 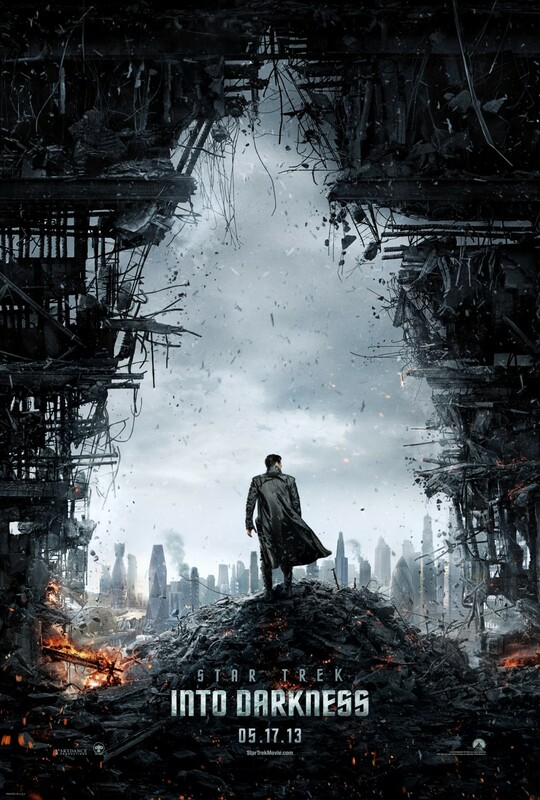 Star Trek Into Darkness is one of the best movies of the Summer 2013 movie season. However, for all of its successes, there is no denying that it is not a perfect work. The movie, which clocks in at just over two hours keeps audiences engaged from the story’s opening moments. And that is thanks in large part to following the standard Summer blockbuster formula. Here’s where things get dicey, and some of this critic’s fellow Trek fans might be angered. To those potentially angered readers, please read this entire review before attacking. One of the biggest factors in the success of Star Trek Into Darkness is that much like its predecessor, audiences don’t have to know the rich history of Gene Roddenberry’s creation that started with Star Trek: The Original Series (TOS). Its references to the movie franchise’s reboot were so few that audiences that have yet to see that movie need not worry about having seen it in order to enjoy this story. Director J.J. Abrams and his staff of writers did an impressive job in keeping this tradition alive from the movies based on both TOS and TNG. Though, those that are long-time fans of both Star Trek TOS and the long running movie franchise will enjoy it just as much as TOS and the movie franchise’s reboot. Long-time fans will enjoy the reference in this movie to the famed Troubles with Tribbles episode from TOS. Long-time fans will enjoy seeing actor Leonard Nimoy reprise his role as the original Spock just as much (not to reveal too much). That’s right. Leonard Nimoy is back once again. And long-time fans will love how Abrams and company poke fun at themselves with his re-appearance. How they go about doing so will be kept under wraps so as to not spoil another positive moment from an overall impressive work. Director J.J. Abrams and his staff of writers did an impressive job making a story that much like the movies from TOS and TNG, doesn’t require knowledge of the previous movie to be enjoyed. This and the references to TOS played important roles in this movie’s success. Just as much cause for success was the personal growth of Chris Pine’s Kirk and Zachary Quinto’s Spock. Kirk starts off in this movie the same brash almost Tom Cruise “Maverick” style figure as they were introduced to in the series’ 2009 reboot. It would be impossible to explain this without spoiling at least one aspect of the movie. That aspect would be that Admiral Pike is killed off. In his death, audiences finally see Kirk grow as a person. They see what was obviously the relationship of a son and his (for all intents and purposes) surrogate father in Pike. Audiences also see the relationship between Spock and Kirk grow even more from their initial meeting in the 2009 reboot. This is perhaps one of very few aspects of this work that would require viewers to have seen the previous film in order to appreciate it. Theirs are the only relationships that show any growth from the previous installment in the franchise. That’s not an entirely bad thing. Simon Pegg is as funny as ever in his role as Scotty. And the relationship between Scotty, Kirk, Spock and Bones produces more than its share of laughs once again. For everything that makes Star Trek Into Darkness such a success, it isn’t without its faults. This story has plenty of comical moments between cast members; enough that they would make quite the blooper reel in the movie’s home release. But one can’t help but look back on the movie and realize just how much running around and yelling filled most of the story. There was so much that in hindsight, it makes for more than enough fodder for Saturday Night Live’s writers to spoof. Thankfully for the movie’s staff of writers, all the running around and yelling wasn’t enough to overpower the story’s main plot that while not overly original, is still nicely updated. It’s a story that is well worth its time overall, whether one is an experienced Star Trek fan or not. To keep up with the latest sports and entertainment reviews and news, go online to http://www.facebook.com/philspicks and “Like” it. Fans can keep up with the latest sports and entertainment reviews and news in the Phil’s Picks blog at https://philspicks.wordpress.com. The soundtrack to the new Spongebob Christmas special, It’s a Spongebob Christmas is one of the best Christmas albums of 2012. This compilation of songs is fun and original. It takes listeners through the recent TV special and takes listeners on a ride through the world of pop music at the same time. The album’s opener, ‘Don’t Be A Jerk (It’s Christmas)’ is a great start to this album that will entertain parents and kids alike. Spongebob, voiced by Tom Kenny, sings of being polite during the holiday season in a variety of ways. From something as simple as using the proper checkout lane at the supermarket to generally being polite to others and respectful towards others’ belongings and more, this song both entertains and sends a very important message to its listeners. The song’s traditional Christmas sound makes it even more entertaining. The album’s enjoyment keeps up after its opener in the rockabilly style of ‘Christmas Eve Jitters.’ The general musical vibe of this song will quickly conjure thoughts of Jerry Lee Lewis, Elvis and any number of other rockabilly/Americana style artists of days gone by. Lyrically, it’s just as entertaining. It does a very good job expressing the excitement and joy that any child feels anticipating Christmas morning. Spongebob sings, “It’s the night before Christmas/And all through my little pad/Not a creature is stirring/Not even mom and dad/But I’m lying here wide awake/No it ain’t the heebeejeebees/nor the eggnog shake/I’ve got the Christmas Eve jitters tonight.” That opening line sets the tone for the rest of the song. It does an excellent job of expressing not only Spongebob’s excitement, but it mirrors the feeling that any young listener has on Christmas Eve. It makes for one more enjoyable song on this album. It’s a Spongebob Christmas Album has more than its share of enjoyable songs for the entire family. Though if there’s at least one that really stands out, it’s the country/western Christmas tune, ‘Ho Ho Hoedown.’ Voice actress Carolyn Lawrence voices Spongebob’s friend, Sandy Cheeks as she sings what Christmas is like in the old Lonestar State. She sings in the song’s chorus, “It’s a Ho Ho Hoedown/Where jingle bells will ring/It’s a down home country Christmas/With a dash of Western swing/Tis the season to be jolly/Like a rodeo clown/Ho Ho Ho Ho Ho Hoedown.” Even if a person isn’t a Country/Western fan, this is a song that will still be as entertaining as any other on the special’s soundtrack. While ‘Ho Ho Hoedown’, ‘Christmas Eve Jitters’ and ‘Don’t Be a Jerk (It’s Christmas)’ are all great songs for the whole family, this soundtrack offers no fewer than nine other songs that will have the kids singing happily right up to Christmas. Even parents might find themselves unexpectedly humming some of the tunes. And there’s absolutely nothing wrong with that, either. The songs here are enjoyable and will be every holiday season no matter how many times they get played and by whom. It’s a Spongebob Christmas Album is available in stores and online now.